The last 4 weeks have been a huge journey for me. They have been emotional and painful – literally. Back in July, I was put on another course of Budesonide (Entocort) to help with my returning symptoms. My doctor thought it might work better this time given I’d only recently come off a course of Prednisone. He was right – it worked better than it had previously. We went on our amazing holiday to New Zealand and amongst other things, cleared our heads. Last year in March/April, the subject of surgery was brought up with me seriously. I was totally dead against it. It’s dangerous and risky and I was more or less fine, right? I suppose I knew I wasn’t. I had an MRI that revealed severe stricturing and fistulation. I didn’t take the surgery option, I took the Prednisone option which will more than likely go down as one of my worse decisions in history. Over the year that followed – I don’t think there are words for how sick I was – not Crohn’s sick, but Cortisol shock, virus after virus and a couple of well placed infections. I was almost constantly sick for 9 months… but my Crohn’s was dormant so, winning? Not winning, not even slightly. My symptoms returned quickly after I finished my last dose of Prednisone and by May I was reduced to tears when the hospital rang to inform me that the outpatients appointment I had been waiting for had been pushed back to September due to the influx of cases. I was desperate and sick and cried on the phone to the lady from bookings – who promptly made me a spot in July before our holiday. I think by that stage I knew – that Surgery was not only on the cards – it was the only hand we were holding. New Zealand is not a holiday you can do with three holes poked in you – so I was medicated over the hump and on the 20th of September on my follow up I finally asked for my surgical referral. It was a big decision for me – I’ve had surgery before, granted not bowel surgery, but I have very clear recollections of my time – if I didn’t, this would be a lot easier. Anyway, after the Gold Coast Hospital moved (from Southporth to Parklands) my referral came up and again (it must be my new “thing”) I burst into tears in front of the surgeon and his student. I was, am, so tired. So worn by Crohn’s and everything that goes with it. This isn’t a decision to have a piece of bowel cut out, this is a decision to reclaim my life. It’s common for us (Crohn’s sufferers) to fight the surgical referral – fact is we will need several surgeries over the course of our life and the subsequent ones won’t be as easy as the first. It is quite literally opening a revolving door… but I’ve learned now, it a door you end up begging to step through. My surgery date was only 9 days after my consult – Wednesday the 13th of November. I was silent. A bit shocked I suppose. I was expecting to wait a few months – in fact I was expecting it to be in the new year. What you aren’t told when you put your hand up, is that Crohn’s and Colitis surgery is considered Category 1 (well, at our hospital anyway). We wait only for surgery on Bowel Cancer. When they said to me (when I first joined Gold Coast Outpatients) “you get the express pass”, they certainly weren’t kidding. After that, at pre-admissions, it was found I have a heart defect called Wolff Parkinson White – and my surgery was delayed to make sure I was safe to sedate… that process has taken 3 weeks. 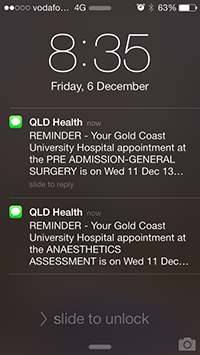 but all the necessary approvals have now been lodged and this morning I got my text reminders from the hospital about my new pre-admissions date. I was terrified at the first one, coming into the second, things are different. I know nothing can be thrown up that will stop my second surgery date, but I’ve also had a 2 week taste of being fully symptomatic again. It has come as a bit of a rude shock and a loathsome reminder of why I am doing what I am doing. I’ve always rolled my eyes at people who complain about their situation in life but refuse to do anything to improve it. I have been rolling my eyes at myself a lot in the last 12 months. We wrote down all the things we were unhappy with – and sadly enough it ended up quite a long list. We also started a plan to change all of those things and found the first step to make real change in our lives was getting mine back. Changing this one thing will give us the means to change everything else. 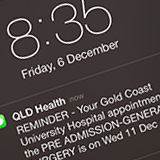 So cheers for my text messages this morning Gold Coast Hospital. And thank you Crohn’s for reminding me why I started this.